Christianity has long claimed Constantine as one of its own. Yet clear evidence for this is lacking. Even toward the end of his reign the emperor was open to new philosophical ideas: the pagan Sopater of Apamea had such influence on him that he was assassinated at the instigation of a Christian praetorian prefect. Even more incongruous is the fact that the “Christian” emperor himself approved of the killing, just as he had previously seen to the execution of both his own wife and his son. At about the time of Sopater’s demise, Constantine also removed from office Christian bishops with whom he had reason to quarrel. For Constantine, it seems it all came down to religious power brokering. Much of our firsthand knowledge of the emperor has been drawn from the writings of Eusebius of Caesarea, best known as a contemporary church historian. On meeting the emperor, Eusebius clearly became an admirer, later writing Vita Constantini, or Life of Constantine. As bishop of Caesarea, Eusebius cast Constantine as very pro-Christian and proclaimed him the first Christian emperor. In the bishop’s view, the kingdom of God had been established with the advent of this emperor—a view that was further developed by subsequent generations of church historians. Eusebius’s biography, at best a panegyric, still forms the basis of most people’s view of Constantine. Unfortunately, it is less than objective. Panegyrics, prevalent in the empire, extolled the virtues and exploits of an emperor or ruler but often without regard to fact or reality. Eusebius’s is not the only chronicle of the illustrious emperor’s life, however. The Christian West has largely overlooked the numerous histories and accounts by profane, or secular, writers both during and after his life. The fact that these writers presented an opposing view of Constantine’s religious sentiments to that of Eusebius, even after the empire professed Christianity, has only recently been considered by the academic world. The assertions of later Christian historians who followed the reasoning of Eusebius notwithstanding, pagan philosophers like Sopater continued to serve emperors in important functions throughout the remainder of the fourth century. Themistius was one of the most important officials in Constantinople over a period of 40 years, from the reign of Constantine’s son, Constantius, until the reign of Theodosius at the end of the fourth century. Themistius was reputed to be quite open about his pagan beliefs and practices. Pagan writers were quick to point out the gaps and ambiguities in Eusebius’s accounts of Constantine, to the point that Christian historians of subsequent centuries wrote histories to stop up the gaps and paper over the bishop’s inadequacies as a historian. Fraudulent works such as “Acts of Sylvester ” and “The Donation of Constantine” are now known to have been written to such an end. Yet these, despite their lack of historicity, shaped the view of centuries of Christians toward church history. What, then, was Constantine’s relationship to Christianity? The late third century was a period of significant unrest in the Roman world. Following a half century of military anarchy, the emperor Diocletian (284–305 C.E.) established a new system of governance—a tetrarchy, or fourfold division of power—to bring order to the empire: Diocletian was emperor, or Augustus, in the East, with Galerius as Caesar (a sort of subordinate emperor); Maximian served as Augustus in the West, with Constantius as his Caesar. Details of Constantine’s birth are open to question but it is clear that because of his father’s position, he was schooled and trained at the court of the most powerful men in the Roman Empire. He served both Diocletian and Galerius in the East during this period and traveled with them throughout Syria, Palestine and Egypt. Some suggest that his presence in the emperor’s court was tantamount to being held hostage to ensure the continued loyalty of his father in the West. Whatever the reason, his time at court enabled the young man to learn under the finest educators as well as to appreciate the problems that existed in the empire. He emerges on the world stage as a man with a grand vision of reuniting the empire. History records his success in that aim. Constantine’s time at court coincided with the persecution of Christians under Diocletian, now considered one of the last efforts of the pagan world to stem the tide of nascent Christianity. A little more than a hundred years earlier, toward the end of the second century, Christianity had developed a mission unlike any that the empire had witnessed before. As the third century progressed, the movement was rapidly becoming a challenge to the institutions of state. The willingness of some Christians to become martyrs rather than submit to the pagan practice of emperor worship amounted to challenging the position of the emperor, thus adding to the problems of imperial governance. Not all Christians were so devoutly committed, however. Some became traditores (from the same root as traitors), persons who changed from one religion to another as circumstances demanded. The number of men who occupied ecclesiastical offices and yet vacillated in this way gave rise to bitter fights within the church. In 306 Constantine traveled to join his father, who was in Eburacum (the Roman city known to us today as York, England) preparing a campaign against the Picts in the north. Both men took part in that campaign. Until recently, scholars had explained the journey to York in terms of his father’s ill health, but some now see it as part of Constantine’s own play for power. 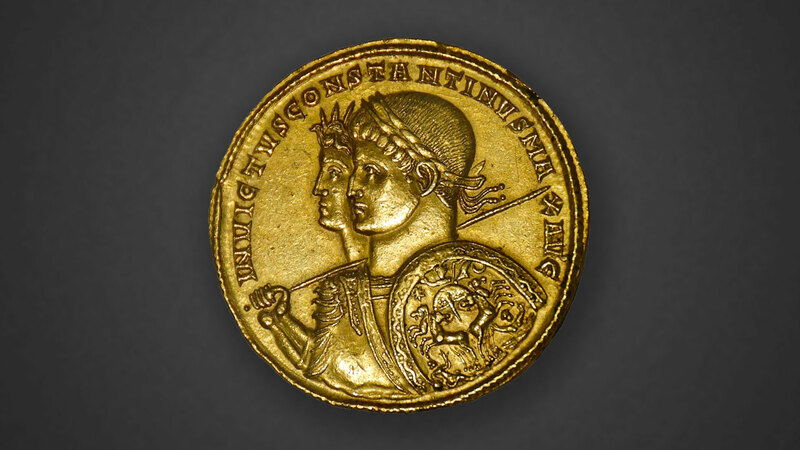 Upon his father’s death, the army declared Constantine the new Western Caesar. Within a few months, Maximian stood down as Western Augustus, elevating Constantine to the role and giving him Fausta, his daughter, in marriage. A man of considerable military ability, Constantine was able to overcome superior forces on numerous occasions. He was compared favorably to the Greco-Macedonian conqueror Alexander the Great and was named victor and triumphator. Through military conquest, he gradually increased his control over the empire from 306 until he became sole emperor in 324. Even before he became emperor, Constantine was well aware of the reach of Christianity. Numerous religions had found a place in the Roman Empire, but they tended to be localized and, as long as the emperor was worshiped, posed no challenge. Christianity, on the other hand, had spread throughout the empire, and its adherents refused to participate in emperor worship. But instead of determining to rid his domain of Christian influence, Constantine thought the growing religion might actually be the means by which he could bring back the sense of imperial unity that had prevailed under Augustus Caesar in the first century. In fact, Christianity proved to be key not only in winning the empire but in keeping it together throughout his reign. While Christians dwelled in every corner of the empire, they were not unified as is normally supposed. Centers of power existed in Rome, in Alexandria, Egypt, and in Antioch, Syria. Language difficulties apart, disagreements on various issues of interpretation as well as corruption created fissures within the Christian religion and thus threatened the unity of the empire itself. As Augustus in the West, Constantine therefore sought to resolve the issues that divided the church. His first challenge was in North Africa, where rival groups were seeking his favor. In response, Constantine established synods for issue resolution. The church effectively became subject to the rule of the state in that an appeal from the synod went to the state. Already existing structures within the church appeared not to matter to the emperor. He put himself in a position to determine what kind of religion Christianity would be. He even declared himself a bishop. Subsequently, in the East, he summoned the bishops of the church to the now-famous council at Nicea in 325 and charged them with establishing, among other things, a uniform position on the place of Christ within the Godhead. This issue had created division, especially in the eastern area of the empire, as bishops debated the ideas of Arius of Alexandria. Although Constantine did not appear to take an overly active part in the proceedings, he exercised a supervisory role to ensure a consensual outcome. In fact, some of the wording used in the edict of the council was his own, both to show how well educated he was in the philosophical issues being discussed, and to establish a feeling for orthodoxy within the church, resolving some of the fractious schisms that had been a hallmark of the developing church up to that time. With such agreement in place, he simply anathematized any bishop who would not hold to a given doctrine. The effect of the changes Constantine implemented was twofold. Church leaders now had access to the machinery of the state to exercise ecclesiastical control. But even more importantly, Constantine himself could establish priorities of bishoprics to suit his goals. Thus the bishop of Constantinople now outranked any other bishop in the East and rivaled the bishop of Rome. Despite his supervisory role in the Council of Nicea and his self-appointed role as bishop, Constantine postponed his baptism until 337, when he was on his deathbed. Baptized or not, he played a major role in shaping traditional Christianity. While Eusebius looked approvingly on Constantine’s actions as a demonstration of true Christianity, more reflection on his part might have produced a different perspective. Reevaluating both Christian and pagan sources of that time, we might rather conclude that Constantine used Christianity to serve his own purpose of unifying and controlling his empire. The early New Testament church in apostolic times existed apart from the empire. Constantine made his Roman Christian church hostage to the state so that now it would serve the needs of emperor and empire. By the end of the fourth century, that church was modeled on the political structures of the Roman Empire it served, and not on the Bible. It assumed the power of the state to establish “right thinking” on the part of its members. Orthodoxy became the order of the day. While pagans and diverse Christian groups continued to coexist and to shape ecclesiastical debates into the fifth century, a powerful organization had been created that would control and expunge from the empire any religious elements deemed unorthodox. Robin Lane Fox, Pagans and Christians (1986). Samuel N.C. Lieu and Dominic Montserrat (editors), From Constantine to Julian: Pagan and Byzantine Views (1996).